Welcome to Music Friday when we bring you great songs with jewelry, gemstones or precious metals in the title or lyrics. Today, we feature the hauntingly beautiful harmonies of Linda Ronstadt and Emmylou Harris in their 1999 duet "All I Left Behind." A song about a woman who unselfishly puts her life on hold to go on the road with her lover, "All I Left Behind" recounts the items she lost along the way, which include her silver earrings and a her dad's gold bracelet. In the end, she loses her lover, as well. They sing, "Silver earrings in Wichita / Beaded moccasins in Tonopah / But I had you so, I just let them go." In a later verse, the story of a cherished keepsake is told: "And the gold bracelet with my father's name inscribed / On the back by the one who loved him all her life / The way I too could have loved you." 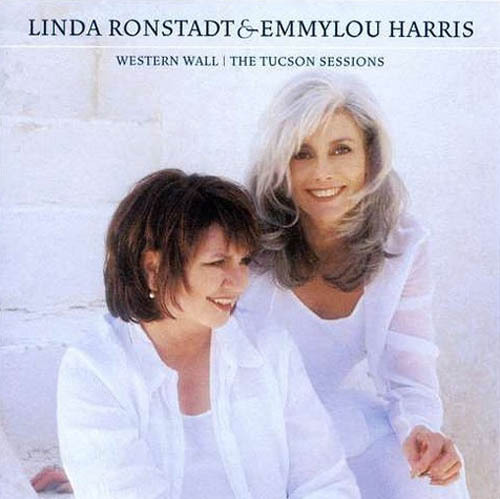 Written by Harris with Kate and Anna McGarrigle, "All I Left Behind" appeared as the 12th track on Western Wall: The Tucson Sessions, a Ronstadt/Harris duet album that included songs written by a virtual Who's Who of the music industry. Among those receiving writing credits on the album were Jackson Brown, Rosanne Cash, Sinéad O'Connor and Bruce Springsteen. Singing background vocals and playing the harmonica on the album was none other than Neil Young. 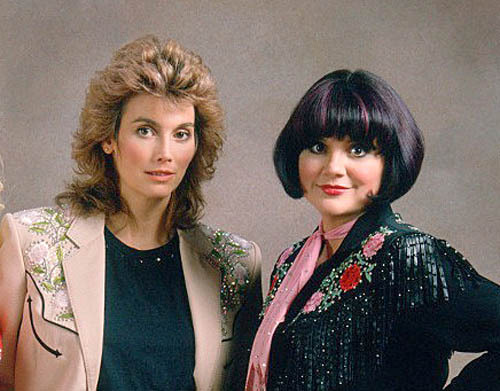 "It took more than 25 years, two divergent careers and plenty of false starts, near-misses and might-have-beens, but Linda Ronstadt and Emmylou Harris have finally made an album together," wrote Bill DeYoung for Goldmine magazine back in 1999. "I believe that there’s a poetic thread that holds [the songs] together," Harris told Goldmine. "I think they all deal with very deep issues about life and love and longing and loss. For me, an album has to be a string of pearls, but they’re all slightly different. They’re not perfectly matched pearls." The album — featuring the velvety alto of Ronstadt and songbird soprano of Harris — earned critical acclaim, hitting #6 on the Billboard Country albums chart while earning several Grammy nominations. Ronstadt, who will turn 70 next month, is a 2014 inductee into the Rock and Roll Hall of Fame. She has released more than 30 studio albums and charted 38 Billboard Hot 100 singles, including "You're No Good," which reached #1. She has earned 11 Grammy Awards, three American Music Awards, two Academy of Country Music awards, an Emmy Award, a Tony nomination and a Golden Globe nomination. The 69-year-old Emmylou Harris also boasts a long and stellar career, during which she accumulated 13 Grammy awards and 39 Grammy nominations. She has collaborated with the industry's biggest names, including Gram Parsons, Bob Dylan, John Denver, Dolly Parton, Roy Orbison, Cyndi Lauper and Ryan Adams. Her most recent collaboration with Rodney Crowell earned the duo a 2016 Americana Music Association Award nomination in the category of Duo/Group of the Year. Written by Emmylou Harris, Kate McGarrigle and Anna McGarrigle. Performed by Linda Ronstadt and Emmylou Harris. Credits: Cropped promotional image for Trio. Album cover image of Western Wall: The Tucson Sessions. To the ancient Egyptians, gold was divine. The gods, they believed, had skin of gold, bones of silver and hair of lapis lazuli. The Turin Papyrus Map, which dates to 1160 BC, affirms the location of 1,300 gold mines, at least 100 of which have been rediscovered and explored in the desert valleys east of the Nile. Today, armed with clues from the ancient mines, modern prospectors are trying to locate untapped Egyptian reserves said to be worth hundreds of billions of dollars. When English Egyptologist Howard Carter discovered the 3,300-year-old tomb of King Tutankhamun in 1925, he was impressed by a sarcophagus that held not one, but three, coffins. The outer two were crafted in wood, covered in gold and adorned with many semiprecious stones. The inner coffin was made of solid gold. 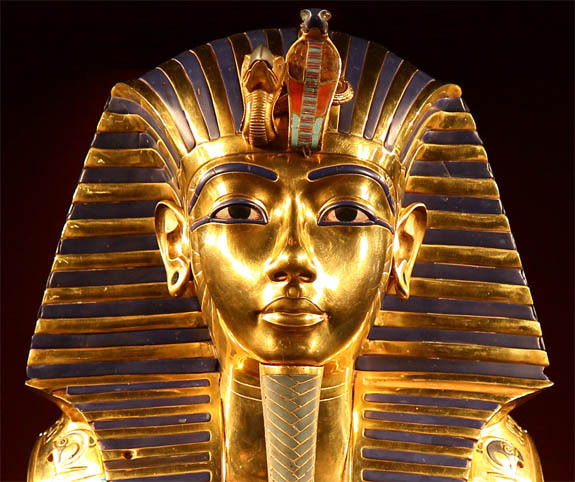 The king's death mask — constructed of two sheets of hammered gold and weighing 22.5 pounds — is considered one of the masterpieces of Egyptian art. 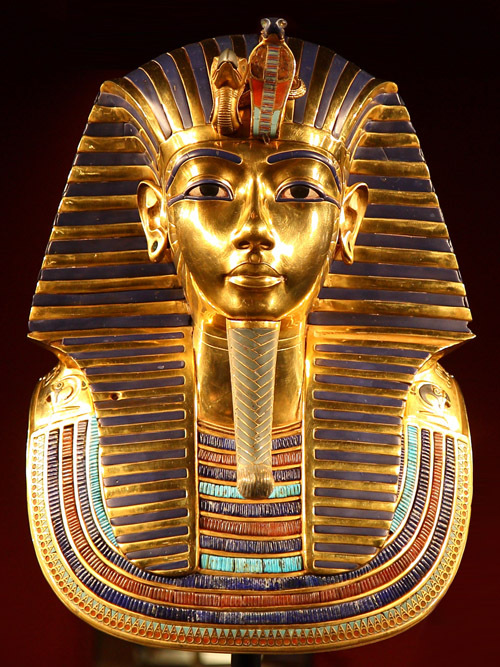 In all, Tutankhamun's tomb was filled with more than 500 items, many made of pure gold. Despite their reverence of gold, the precious metal held no monetary importance in ancient Egyptian commerce. Salaries were paid in goods, and trade was done with barter. Gold maintained a vital role in religious ceremonies, adorning royal jewelry, artifacts and chariots. Contemporary treasure hunters are betting that the ancient miners — lacking modern tools and know-how — left plenty of gold behind. Those miners rarely dug down more than 20 or 30 meters. "We are looking where they had mined gold before," Mark Campbell, the chief executive of Canada-based Alexander Nubia, told CNN. "Using modern mining techniques and technology, we hope to recover a lot of the gold that [the Roman and Egyptian civilizations] missed, because they were unable to mine it and process it." Mining for gold in the Egyptian desert is risky business due to the extraordinary expense of modern extraction techniques. Campbell estimated the investment would be "somewhere in the order of 500 million to a billion dollars." Credit: Tutankhamen's death mask by Carsten Frenzl from Obernburg, Derutschland (TUT-Ausstellung_FFM_2012_47) CC BY 2.0, via Wikimedia Commons. Over the past 113 years, a single mine in South Africa has been the most prolific source of the world's largest and finest-quality diamonds. 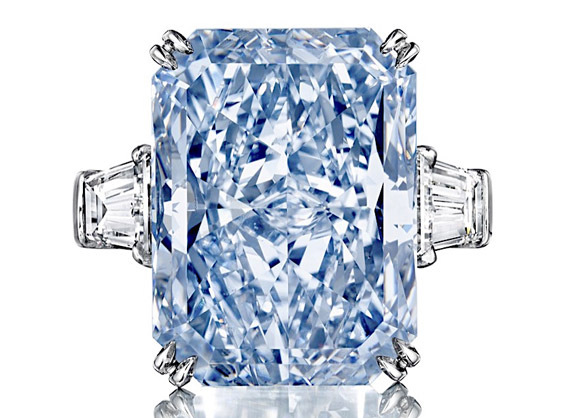 On June 9, the 24.18-carat "Cullinan Dream" — named after the mine that famously yielded the 3,106.75-carat Cullinan — broke the record for the highest price ever achieved for a fancy intense blue diamond. It was the largest diamond of that color classification to be offered at auction. Bidders at Christie’s Magnificent Jewels auction in New York watched the hammer go down at $25.4 million, which was in the mid range of the auction house's pre-sale estimate of $23 million to $29 million. Discovered at Petra Diamond's Cullinan mine in 2014, the rough diamond that produced the Cullinan Dream weighed 122.52 carats. 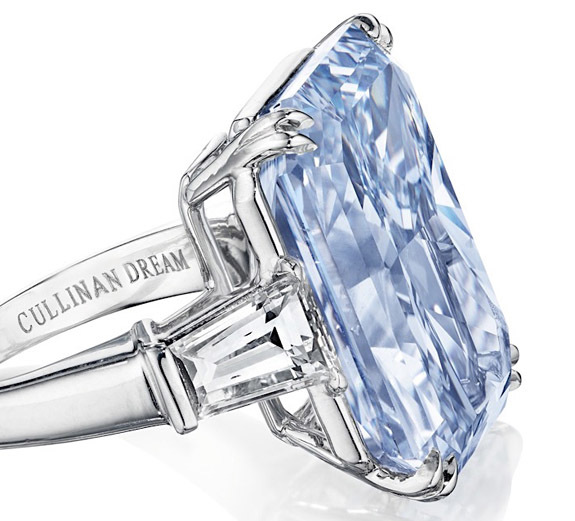 From that rough stone, a master gem cutter eventually delivered four notably sized blue diamonds: a cushion-cut gem of 7.00 carats, a radiant-cut gem of 10.30 carats, a pear-shaped gem of 11.30 carats, and finally, the Cullinan Dream, a cut-cornered rectangular mixed-cut gem of 24.18 carats. Set in a ring, the Cullinan Dream is flanked by tapered baguettes in a platinum mounting inscribed “Cullinan Dream.” The baguettes have a total weight of 2.36 carats. 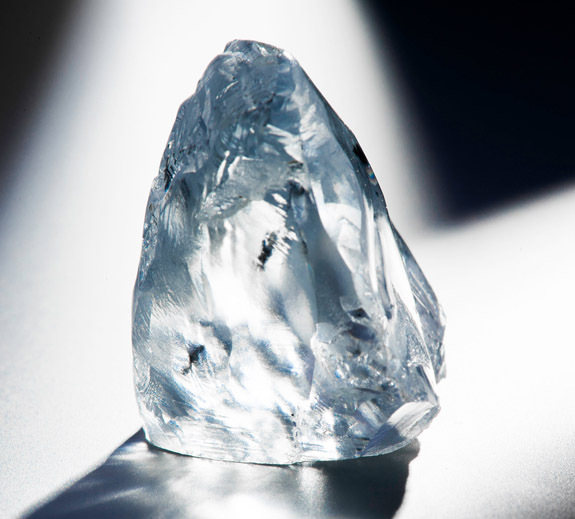 Petra Diamonds had sold the 122.52-carat rough blue diamond into a cutting and polishing partnership in 2014 for $23.5 million and maintained a 15% stake in the proceeds from the Cullinan Dream after it was sold at auction, minus expenses. While setting an auction record in the "fancy intense blue" category, the Cullinan Dream's selling price was less than half the amount earned by the much smaller "Oppenheimer Blue," which yielded $57.5 million at Christie’s Geneva in mid-May. The 14.62-carat Oppenheimer Blue was able to set a new world record for any jewel sold at auction because it carried the top color grade of "fancy vivid blue," the top purity rating of Type IIa, and the near-perfect clarity rating of VVS1. The Cullinan Dream, by comparison, had a clarity of VS2 and a purity rating of Type IIb. The Cullinan Dream represents the latest generation of super-large, super-fine diamonds to be sourced at the Cullinan mine. Since production started in 1903, the mine has delivered 750 stones weighing more than 100 carats, 130 stones weighing more than 200 carats, and more than a quarter of all diamonds in existence weighing more than 400 carats. The mine is expected to be productive for the next 50 years. Credit: Images courtesy of Petra Diamonds. The champion Denver Broncos received their Super Bowl rings in a private ceremony held at Mile High Stadium on Sunday night. Adorned with 194 diamonds and a flourish of orange sapphires, the two-tone 10-karat gold rings commemorate in high style the team's 24-10 impressive victory over the Carolina Panthers in Super Bowl 50. Photos taken by the players and posted to Twitter confirm the huge proportions of the rings, which boast a diamond total weight of 5.05 carats and seem to dwarf the massive fingers of the most imposing athletes on the planet. The rings were delivered to the stadium under high security in padlocked boxes, one for each player, coach, front-office member and support staff. 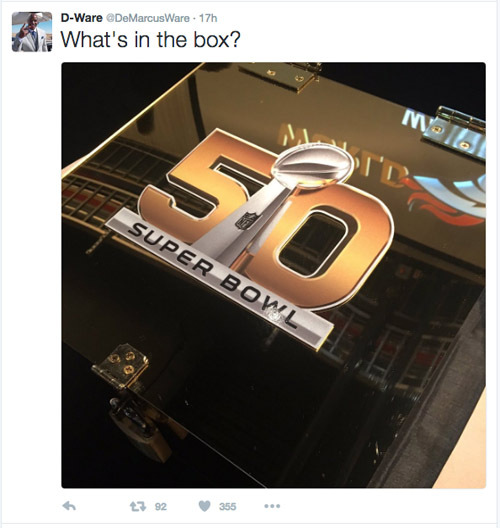 Each box was emblazoned with the logo of Super Bowl 50. As with all Super Bowl rings, the Broncos' treasure is teeming with symbolism. 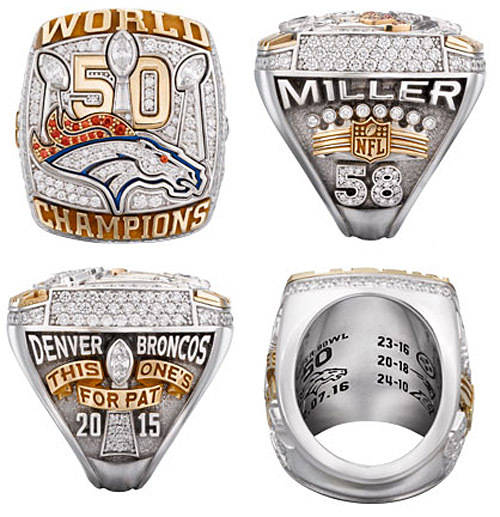 The ring's face features the Super Bowl 50 logo and the team's three Lombardi Trophies placed above the Denver Broncos logo on a field of pavé-set diamonds. The trophies are created from marquise-cut stones, tapered baguettes and pave-set stones, and represent the franchise's three Super Bowl wins. The Bronco mane is designed in three waves of bright orange sapphires, while the head features pavé-set diamonds. The Bronco's eye is a round orange sapphire. The words "WORLD CHAMPIONS" adorn the top and bottom edges in raised gold letters. 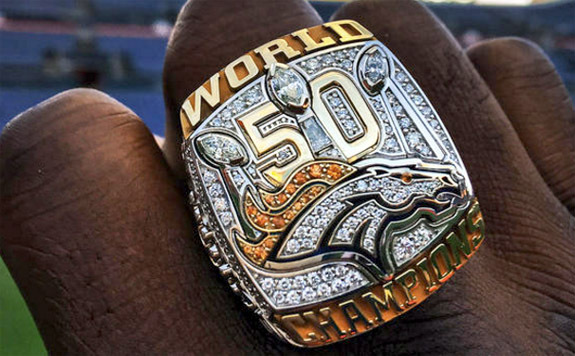 The left side of the ring features the player's name above an image of a crown, which is a nod to the crown featured on past Broncos Super Bowl Championship Rings. The crown's three stripes represent the three Super Bowl titles. Eight round diamonds adorn the top of the crown and represent the team's eight AFC Championships. The player's number sits below the crown and is created from round pavé-set diamonds. The right side features the words DENVER BRONCOS arched above an image of the Lombardi Trophy and the year 2015. The trophy is created from marquise-cut and pavé-set diamonds and is surrounded by a 10-karat yellow gold banner inscribed with the words "THIS ONE'S FOR PAT" in honor of Denver Broncos Owner Pat Bowlen, who is suffering from Alzheimer's disease. Both sides of the ring are set with 28 diamonds, for a total of 56, marking the 56-year history of the Denver Broncos. The front and back edges each have 15 stones representing the 15 Divisional titles the Broncos have won and the team's 15 regular season and playoff wins in 2015-16. 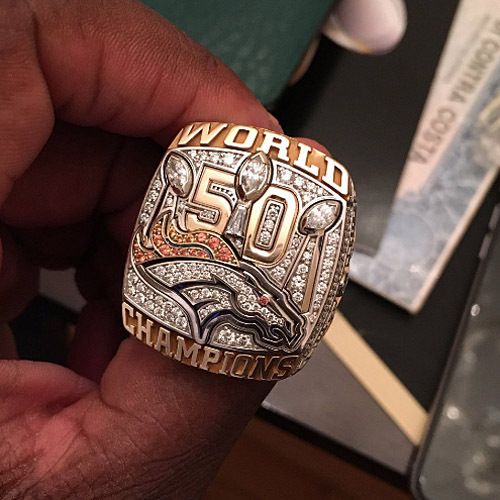 The inside of the ring features the Super Bowl 50 logo and the Broncos logo above the Super Bowl date of 02.07.16. The scores of the three playoff games are listed next to the logos of the teams the Broncos defeated. On hand to help the team celebrate were legendary players who were on past Super Bowl teams. Terrell Davis and Rod Smith were entrusted with the task of handing out the keys that opened the padlocked gift boxes. Neither the ring manufacturer, Jostens, nor the Broncos' management would disclose the value of this year's rings. What we do know is that the Super Bowl XLIX rings of the New England Patriots were valued at $36,500. 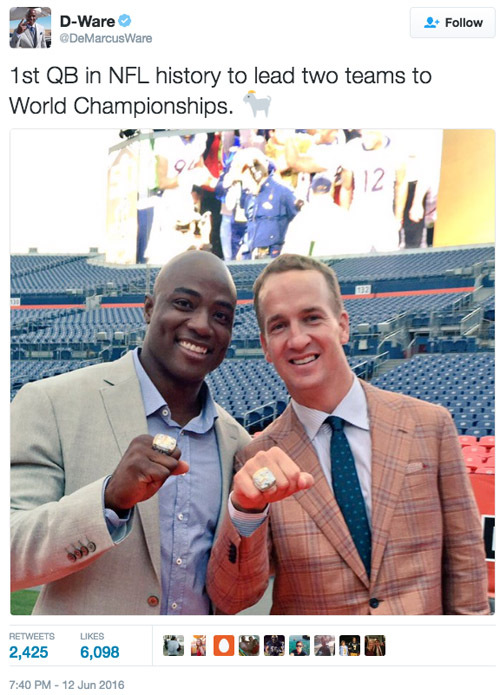 Credits: Twitter.com/@anu_nike91; Twitter.com/DeMarcusWare; Twitter.com/cjandersonb22; Jostens. 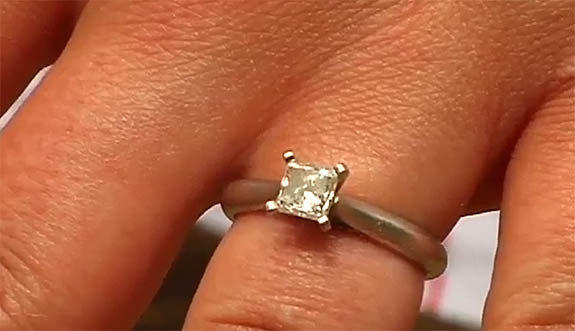 Missouri bride-to-be Linda Huffman says the 1-carat solitaire engagement ring she got on Valentine's Day from fiancé Steve Kozlowski is "the only thing I've had in my life that was perfect." 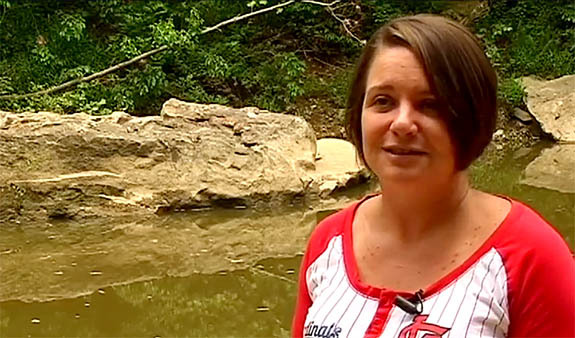 But after a swimming mishap at a local creek on Memorial Day, she was sure her perfect ring was lost forever. Huffman had been spending a glorious day with her family and friends at Dry Fork Creek, about 100 miles southwest of St. Louis, when she attempted to climb upon a huge boulder that jutted from the shore out into water. But she lost her footing, fell back, banged her hand against the limestone and the ring went flying. "I was for sure that it was gone," Huffman told krcgtv.com. The newly engaged couple, with the help of their loved ones, attempted to use swim goggles and snorkel gear to find the ring, but with only 3 inches of visibility there was little hope of locating it. Then a storm broke out and the couple had to abandon the search. 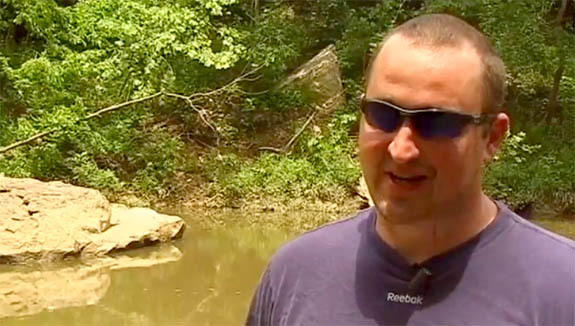 Knowing how much the ring meant to his fiancée, Kozlowski called for expert assistance. 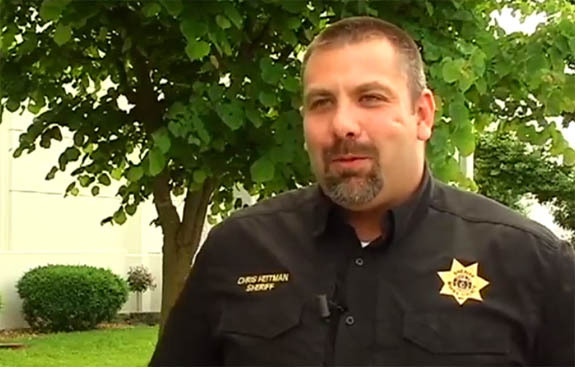 He recruited Maries County Sheriff’s Deputy Dennis Jasper and Sheriff Chris Heitman, both of whom are members of the Mid-Missouri Sheriffs’ Dive Team. “It isn’t something we typically do," Heitman told stltoday.com, "but for something as important as an engagement ring, we’re there,” he said. Jasper compared the prospects of locating the ring to "finding a needle in a haystack." On the first day of the search, Heitman did his best to scour the bottom of the muddy creek but had to give up after depleting his air supply. Undaunted, he was back on Day 2 to try again. Based on Huffman's more precise description of how she fell off the rock, Heitman guessed where the ring may have landed and worked a new area. Again, the search was proving unsuccessful. "I was exhausted. 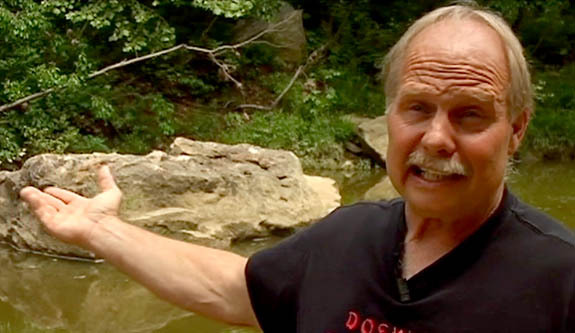 I was almost out of air in my tank," Heitman told krcgtv.com. But then he saw the ring and plucked it out of the mud. Heitman was so excited when he came up out of the water that he looked Kozlowski straight in the eyes and joked, "Will you marry me." Then Kozlowski started screaming. Huffman and Kozlowski, who had dated for 17 years before getting engaged, couldn't be more appreciative of the extraordinary recovery efforts. With the ring properly resized, the couple is planning an April 2017 wedding with Dry Fork Creek as the scenic backdrop. It was the site of their first date and, now, a miraculous ring recovery. "We got a story to tell the grandkids," she said. Credits: Screen captures via krcgtv.com.